1. Click 'Game Start' button after logging in at website. 3. Install game after moving to website through 'Game Download' button. ("Game Start" button will appear if already installed.) After installation is completed, click 'Shortcut' icon on desktop. 4.4. 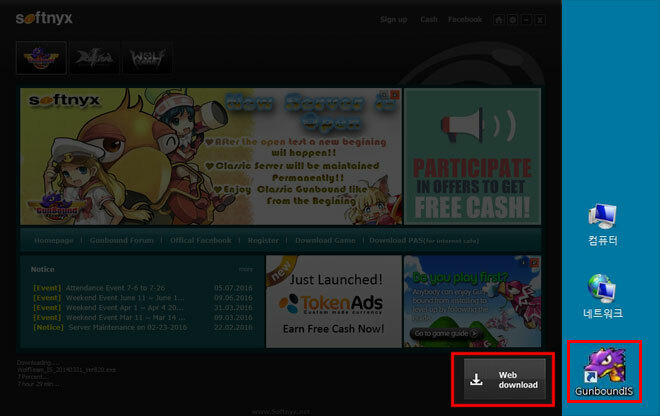 You will automatically access to game after clicking 'Game Start' button at website and 'Play Now' button on the new launcher. a. 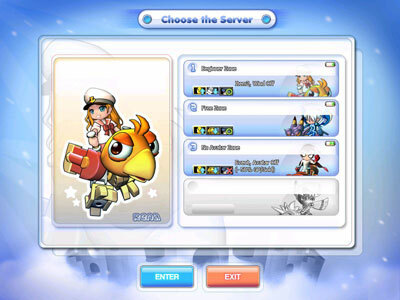 Double click to select a server. The downward arrow shows the min level required to enter the server. The upwards arrow shows the max level required to enter the server. Avatar on/off is shown by O, X. All List / Waiting room : Shows the all game room or only waiting room by the type you select. Basic arrayal is All list. Quick Join : Join in the room directly without searching it. Create Room : Create new game room. Room Number : Enter to the room directly by inserting game room number. Show the game room list. Check my character information. (GP, gold, cash, Gcoin). Charge : Recharge Game Cash. User List : Shows list of users in the particular channel. Buddy List: See my buddy list. Color chatting : Select chatting color. Bugle: send the message to all user who located in the same server. Bugle block: block the bungles which are sent by other users. Enter dialogue here to chat. Menu : Shows all the game menu. Inventory : Enter inventory and check your items. My info : Check the details of my information. Event : See the event information. Option : Open the option window. Back : Go back to the server list. Show the room number and room title. Only a room master can change the room title. Show a player's level, ID, Ping. 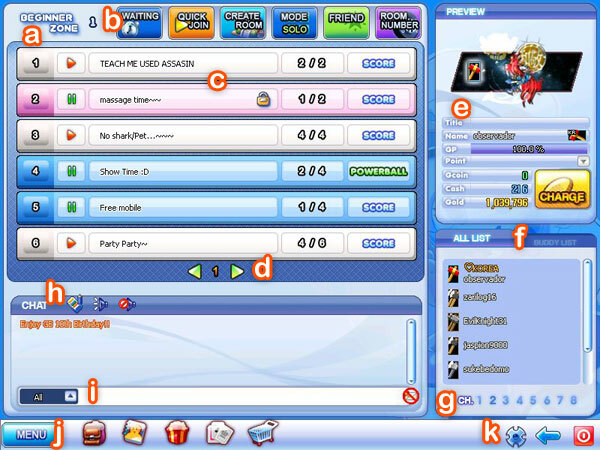 Show list of users in the game room and team. See the moon disks settings for the selected map. The moon disks will appear in a random order. Room master will see "Game Start" button and other team members will be "ready" button. All players must be "ready" before the room master can start the game. Bugle: send the message to all user who located in the same server. Bugle block: block the bungles which are sent by other users. 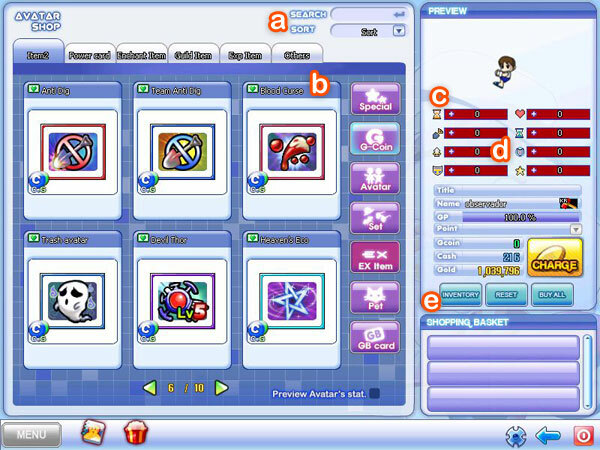 Item setting: Show window to select the game items for game. Item1: Basic item. Free items for game. Item2: Expendable item. You need to purchase it in shop. 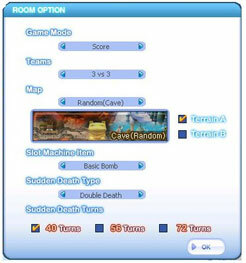 Mobile select : Select mobile for game. Room setting : Change game option (room master only). Mute List : block the chatting which are sent by users selected. Invite : Send a message to players to join this room. Shows time left to make your shot. Shows current wind direction, speed and Moon disk. The land of force "Ronde" is filled with energy and when "Star of Force" appears, the satellite and the Ronde interacts their energy. And while doing that, the pole of energy is created from surface to satellite. The Force remains until the Star of Force hovers over the land of Ronde and when Star of Force appears continuously, more Force is created. The bomb that went through the Force increases its power according to the time it remained inside the Force. The satellite fires strong radiation heat and it heats up the surface and create Hurricane. Hurricane remains until the Star of Hurricane remains and if the Star of Hurricane appears continuously more Hurricanes are created. It creates hurricanes and manages it. The bomb that goes through Hurricane will be twisted by the blowing wind and the direction of the shot will be altered. It is a steel satellite with strong protons. It is said to be made by the ancient civilization and its function is not known by the people of the Ronde. The pole of electricity remains until the Star of Magnetic Force remains and when the star of Magnetic force appears continuously more eletric-poles appears. It creates electric-pole and manages it. Bomb that goes through the eletric-pole get magnetic force and creates thunder bolts. It is the biggest and coldest satellite to orbit the planet of Ronde. It sends down its cold airs to weaken the land below. Conocida como la madre de todas vida, tiene el poder mágico de multiplicar la energia vital. Incrementa la energia de todos los tipos de móviles, especialmente los tipo Biónico que aumentan su energia al doble. It is a small satellite with enormous power to attract all the surrounding energy. All the items are disabled and all the items used at last turn loses its functions. And even the shield-type mobile stops recovering its shield. A battle hammer known to have used by the mythological warlord named Toul, due to its massive weight alongside with its powerful laser, one swing alone possess the awesome destructive power beyond your imagination. This is the ultimate lord's weapon only used for the purpose of destruction. The name of the 8th moon is the Destruction and when the moon rise a big war satellite appears in the middle of the game screen. This war satellite shoots the players and when it hits the mark extra shots are fired to the spot to increase the damage. Also this war satellite feeds and grows into a even more powerful one by the damage it causes to the players. Before : Your previous shot angle. Now : Your current shot angle. Select weapon 1, 2 or SS. Slots for item1 and item2. To use item, you need to select one of items before you shot. This is the gauge showing the strength of the shot you are firing from your mobile. There are 3 different kinds of shot types available. You can change the shot type on Game option. Drag shot : Click on a game screen then drag the cursor as much to the power you wish to apply to the shot. The advantage of this type is that you can reduce the delay significantly but the controlling the amount of strength is not very easy so best recommended for the high level players. Gives indication of how further you can move on the terrain. Menu for each game mode. Option : Open the game option window. Exit : Quit playing game. After each game play, you can see the game result. 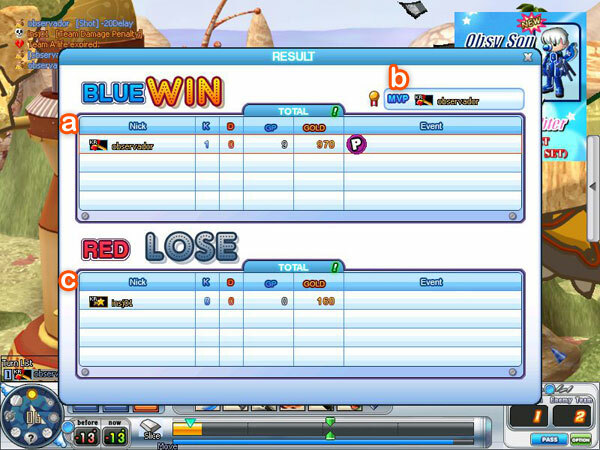 The Game result page will be disappeared with the passing of time and player will be moved to game waiting room. IWin team info : Game ID, Kill count, Death count, GP&Gold, event etc. Best player in win team. lose team info : Game ID, Kill count, Death count, GP&Gold, event etc. Arrange items by each type. Show ability and price of items. Try on the selected avatar before purchase. by double clicking on the item. Show sum of avatar ability that you try on. Changes the existing delay of the mobile you are using. The ability to fascinate the crowd with your best costume in order to gain more prize (ie. Gold) which effects the amount of money and the penalty you will be given. Changes the damage which your mobile receive during a battle but does not apply to the bombing system. Changes the defense ability of your mobile. Changes the energy level of your mobile but does not affect the shield. 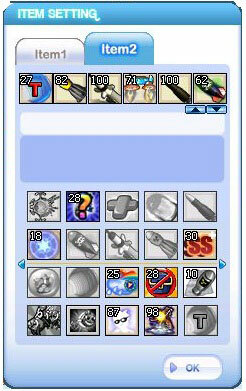 Increases the recover ability for the shield typed mobiles. Minimize the amount of delay when using an item. Increases the area of pit made during an explosion. Inventory : Move to inventory. Pet training :Go to pet training page. How to control Keyboard and mouse in the game. 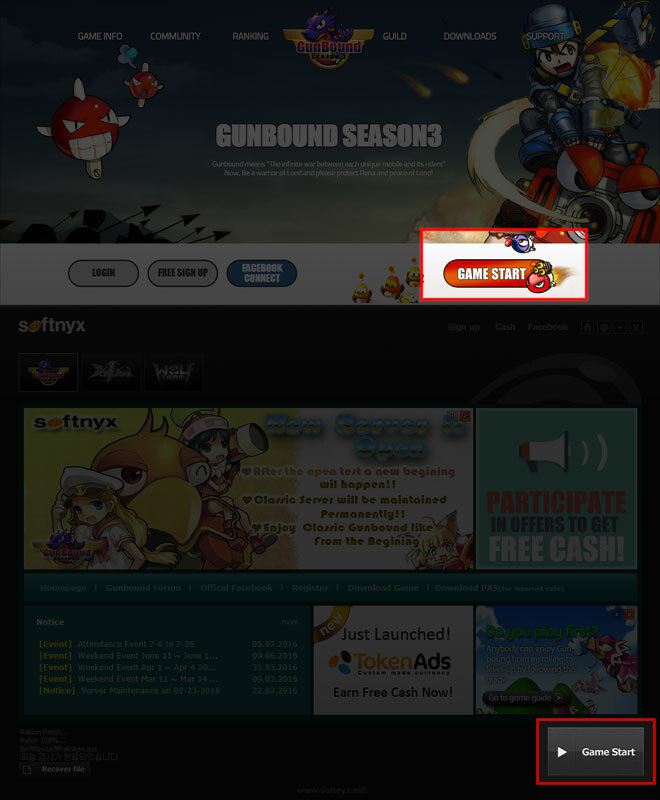 It's Softnyx account login ID to connect to homepage or game. Login ID can’t be changeable. It's a nick name id in the game. It is consisted of only alphabet and number. Game ID is changeable using Change Game ID item. It's a game money in Gunbound. You can earn it by playing game and it is used to buy items in shop. It can be charged through various methods with real money. it is used to buy items in shop. It's saving point. 5% of your cash consumption in game is saved to G-coin. You can buy cash items by Gcoin substituting for cash. It can not be charged with real money. It's the experience point and it can be earned by playing a game. It is a clothe or background item to decorate your character in the game. You can buy these with gold or cash. It's an item which can be used in the game. It doesn't consume gold or cash to buy. It is an item which is used in the game and it can be purchased by gold, cash or Gcoin. It's a tank you will use in the game. 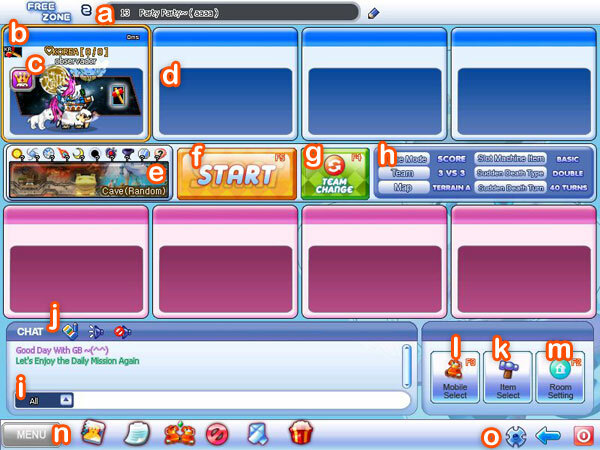 It's a program where you type your login ID and PW to connect in the game. 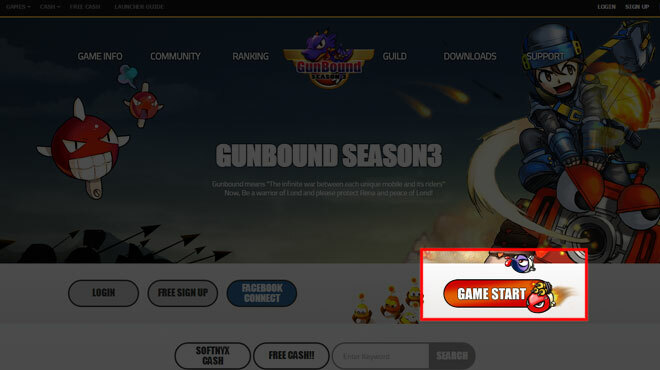 This program appears when you double click Gunbound icon. If you set your security level to high, the mail address you registered can't be changed and mail verification can’t be available. So you have to set the security level to None to use mail verification system. Your grade will be chosen by GP. The class which is decided by cash charge amount. It can be used in event period. A team which consist by the users who you want to play with. The place where you buy items. Illegal way to increase GP by committing suicide or losing on purpose. Your account can be banned by Softnyx if you did illegal behavior.